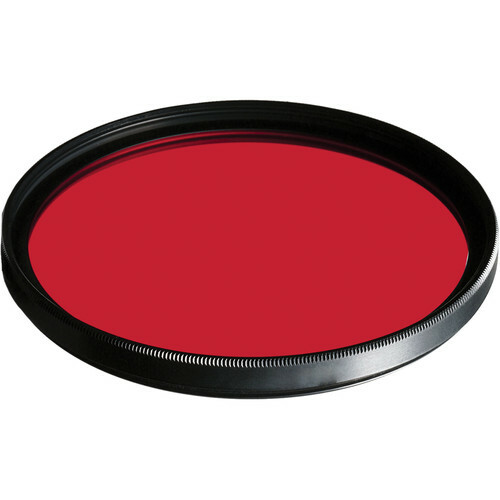 This 60mm Dark Red MRC 091M Filter from B+W is used to increase contrast and tonal separation in black and white photography. It enhances clouds while making skies and foliage appear darker, creating dramatic land and skyscapes. Distant objects will be rendered more clearly because the filter cuts through haze and fog. It has a filter factor of 8, requiring exposures to be increased by 3 stops. Its Schott Glass construction uses Multi-Resistant Coating (MRC) technology to reduce reflections and ghosting; protect from scratches; and repel dirt and water. The F-Pro Mount ring has front threads to allow another filter to be threaded on top. B+W has also made the F-Pro Mount thinner so it will not cause vignetting on lenses as wide as 24mm. The ring is made from brass, which is a softer metal that prevents the ring from binding on the front of the lens. Multi-Resistant Coating (MRC) reduces reflections and ghosting; protects from scratches; and repels dirt and water.